seismogram is a graph output by a seismograph. It is a record of the ground motion at a measuring station as a function of time. Seismograms typically record motions in three cartesian axes (x, y, and z), with the z axis perpendicular to the Earth’s surface and the x- and y- axes parallel to the surface. The energy measured in a seismogram may result from an earthquake or from some other source, such as an explosion. Seismograms can record lots of things, and record many little waves, called microseisms.. These tiny microseisms can be caused by heavy traffic near the seismograph, waves hitting a beach, the wind, and any number of other ordinary things that cause some shaking of the seismograph. Historically, seismograms were recorded on paper attached to rotating drums. Some used pens on ordinary paper, while others used light beams to expose photosensitive paper. Today, practically all seismograms are recorded digitally to make analysis by computer easier. Some drum seismometers are still found, though, especially when used for public display. Seismograms are essential for finding the location and magnitude of earthquakes. 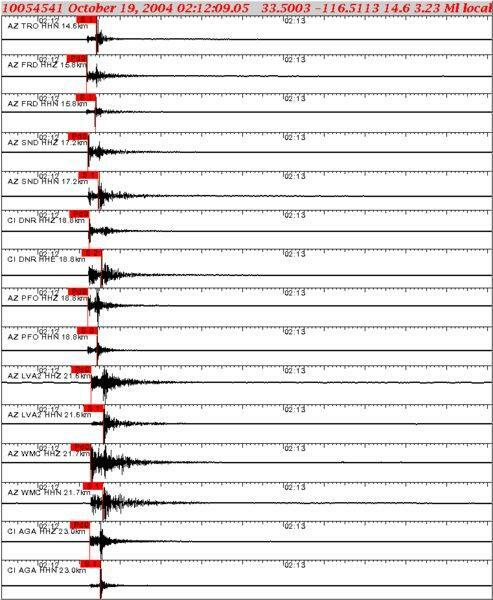 Seismograms are read from left to right. Time marks show when the earthquake occurred. Time is shown by half-hour (thirty minute) units. Each rotation of the seismograph drum is thirty minutes. Therefore, on seismograms, each line measures thirty minutes. This is a more efficient way to read a seismogram. Secondly, there are the minute-marks. A minute mark looks like a hyphen “-” between each minute. Minute marks count minutes on seismograms. From left to right, each mark stands for a minute. Each seismic wave looks different. The P-wave is the first wave that is bigger than the other waves (the microseisms). Because P waves are the fastest seismic waves, they will usually be the first ones that the seismograph records. The next set of seismic waves on the seismogram will be the S-waves. These are usually bigger than the P waves, and have higher frequency. Look for a dramatic change in frequency for a different type of wave. How do I read a seismogram? As mentioned previously, seismograms record more than earthquakes, and it isn’t always clear what all the different wiggles represent, even with training (Figure 3). But lets look at a simple seismograms from an earthquake (Figure 1) with the understanding that seismic waves travel discrete paths with distinct behavioral differences, important information in interpreting seismograms. When an earthquake occurs, it releases energy in the form of seismic waves that radiate from the earthquake source in all directions. The different types of energy waves shake the ground in different ways and travel through the earth at different velocities. Ground vibrations are similar to sound waves in air, but span a wide frequency range that extends well below the threshold for human hearing. For a large earthquake, the compressive P wave will be the first jolt that is bigger than the background noise (the microseisms). Because P waves are the fastest seismic waves, they are usually the first recorded. The next set of seismic waves on your seismogram will be the S waves that travel at about 0.6 times the velocity of P waves. These are generally higher amplitude than the P waves. They travel with a shearing motion which slows them, but can cause greater ground motion. 3) the medium the wave traveled in: soft sediment can amplify waves that were small when traveling through solid rock. Regional stations equidistance from a distant earthquake could have markedly different amplitudes if they are located on different substrates, though the P-, S-, and surface-wave arrival times will be about the same. The maximum disturbance or distance from the constant point. On a seismogram the horizontal time line is flat until there is a ground disturbance which is recorded as wave, or seismogram. The amplitude of a seismic wave is the amount the ground moves up or down. Amplitude is one-half the distance between the crest and trough of one wave length. In drawing at right, maximum displacement is 2 + 2 = 4, so Amplitude = 0.5 * 4 = 2. Waves that move within the Earth’s interior or within a body of rock. P and S waves are body waves. A) Tectonic Earthquake: earthquake that occurs when the earth’s crust breaks due to geological forces on rocks and adjoining plates that cause physical and chemical changes. B) Volcanic Earthquakes: earthquakes that result from tectonic forces which occur in conjunction with volcanic activity. C) Collapse Earthquakes: small earthquakes in underground caverns and mines. The point on the Earth’s surface directly above the focus of an earthquake. The magnitude is a number that characterizes the relative size of an earthquake. Magnitude is based on measurement of the maximum motion recorded by a seismograph. Several scales have been defined, but the most commonly used are (1) local magnitude (ML), commonly referred to as “Richter magnitude,” (2) surface-wave magnitude (Ms), (3) body-wave magnitude (Mb), and (4) moment magnitude (Mw). Scales 1-3 have limited range and applicability and do not satisfactorily measure the size of the largest earthquakes. The moment magnitude (Mw) scale, based on the concept of seismic moment, is uniformly applicable to all sizes of earthquakes but is more difficult to compute than the other types. All magnitude scales should yield approximately the same value for any given earthquake.. The preferred measure of earthquake size (magnitude) in which the stiffness of the rock, the average slip on the rupture plane, and the area of the rupture plane are taken into account (the “moment” of the earthquake). See magnitude. An elastic wave generated by an impulse such as an earthquake or an explosion. Seismic waves may travel either through the earth’s interior (P and S waves; the fastest waves) or along or near the earth’s surface (Rayleigh and Love waves). Seismic waves travel at speeds of several kilometers per second. The geographic and historical distribution (the “where?” and “how often?”) of earthquakes. A real-time record of earthquake ground motion recorded by a seismograph. Seismograms are the records (paper copy or computer image) used to calculate the location and magnitude of an earthquake..
An instrument that records vibrations of the Earth, especially earthquakes. Seismograph generally refers to the seismometer and a recording device as a single unit. See IRIS’ Seismographs. Science that deals with earthquakes and attendant phenomenon including the study of artificially produced elastic waves in the Earth’s material. Waves that move close to or on the outside surface of the Earth rather than through the deep interior like the faster P or S waves. Two principal types of surface waves, Love and Rayleigh waves, are generated during an earthquakes. Rayleigh waves cause both vertical and horizontal ground motion, and Love waves cause horizontal motion only. They both produce ground shaking at the Earth’s surface but very little motion deep in the Earth. Because the amplitude of surface waves diminishes less rapidly with distance than the amplitude of P or S waves, surface waves are often the most important component of ground shaking far from the earthquake source. Secondary body waves that oscillate the ground perpendicular to the direction of wave travel. They travel about 1.7 times slower than P waves. Because liquids will not sustain shear stresses, S waves will not travel through liquids like water, molten rock, or the Earth’s outer core. S waves produce vertical and horizontal motion in the ground surface.